The OMNI start-up from our 2016 cohort who have successfully joined a programme in China and got support to develop their product for more information see below. Posted by Paul Bailey on April 7, 2017 in Uncategorized. As part of our collaboration with Surf Netherlands around innovation in learning and teaching we held joint event hosted at the Jisc London office on Tuesday 24 January 2017. The event was attended by 45 people including a Surf study group of about 20 people. Delegates from the UK presented examples of how they are working with students to support innovation. Paul Bailey, Jisc Summer of Student Innovation. Approach and examples of competitions to encourage and support educational technology innovation. The Ed Tech Startups and the Student Ideas Competition provide a process to surface new innovations and product that can help students and institutions. This presentation will provide an overview of the process and some examples of the winners. Tom Lowe, REACT Project Manager, The University of Winchester. REACT (Realising Engagement through Active Culture Transformation) is a HEFCE-funded project designed to investigate the impact of different of forms of engagement on the student experience. A special focus is on so-called ‘hard-to-reach’ students, with the aim of embedding inclusive student engagement opportunities in the 16 participating universities. This presentation will share best practice through the dissemination of the research findings, interventions and project outputs of the REACT project across sixteen HEIs. Emily Parkin, University of Lincoln and Marcus Elliott, Bishop Grosseteste University. Presentation of examples and experiences of implementing student /staff partnerships work around innovation at the University of Lincoln. Delegates from the Netherlands explained how they use Innovation Centres to support staff to explore emerging technologies such as Hololens, 3D Cameras, etc. to look at new ways to support learning and teaching. Short introduction about SURFnet, the collaborative organisation for ICT in higher education and research in the Netherlands, the ‘Customized Education Program’ and ‘Testbed for innovative ICT applications’. In Testbed, the possibilities for new ICT technologies and applications in education are explored among other things in the Innovation Challenge. Thomas Hurkxkens, Centre for Innovation The Hague & Leiden University. The Leiden University Centre for Innovation and the Leiden University Medical Center (LUMC) are 1 out the 5 winners of the SURFnet Innovation Challenge 2016-2017. They won the prize with an experiment to link a virtual 3D anatomical model to a living human body. They developed an experiment whereby a virtual anatomical model is displayed next to a real human body. This allows medical students to learn from their own physical movements, while at the same time studying the virtual anatomical version of the body. This method of learning is made possible with the Microsoft HoloLens-technology. Eduardo Hermsen & Wytze Koopal, University of Twente. Stimulating and supporting educational innovation with a multidisciplinary team. What are our experiences with working in a multidisciplinary team supporting teachers on implementing technology in education? The University Twente started last year with the TELT-Team (Technology Enhanced Learning and Teaching – team). In this team we work with specialists from different disciplines on educational innovations. One of the projects is the development of MOOCs that focusses on teacher professionalization. Frank Rem Graafschap College and Norbert van Eys ROC van Amsterdam. Innovation in Vocational Education in the Netherlands. Technology is making a big impact on vocational education, both in the classroom and on the workfloor. As vocational schools we have a unique responsibility to make sure our students are taught the latest work-related technology and are being educated with the most current tech. In this talk two schools will share their vision on integrating technology to make the classroom and our students keep up to date. The event provided a useful opportunity to share approaches to innovation and establish new contacts. The delegates from the Netherlands departed for a guide tour of London (which translated to pub crawl) and to attend BETT 17. Posted by Paul Bailey on January 27, 2017 in Uncategorized. “This will change my life” – comment from students attending the Summer of Student Innovation 2016 design sprint. Two students separately said this to me but I am sure many others feel the same. 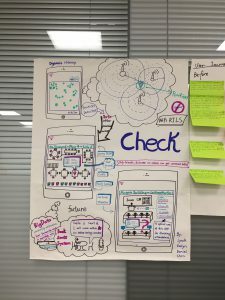 At my age I can point to several experiences that have changed my life, not all positive, however it is especially pleasing to see that this can be so influential in the lives of students who participate not just in the Jisc Summer of Student Innovation but also in the hundreds hackathons, enterprise and innovation competitions offered each year.. So what makes the design sprint such an amazing experience? Obviously it is the 15 teams who participated, as well as the mentors and experts who facilitated and supported the team. See Scott Hibberson’s blog post account of his experience as a mentor. However after four years of running these events I think it is also the structure of the design sprint we started using last year designed for us by LiveWorks based on the google 5-day design sprint. The design sprint is a four day residential camp where teams work collaboratively on their projects submitted to the student ideas competition. Day 1: Understand your idea. Teams unpack the idea, explore the boundaries through competitor and market analysis, SWOTs and identifying users. The day is about opening up the options and looking outside the box a bit more. 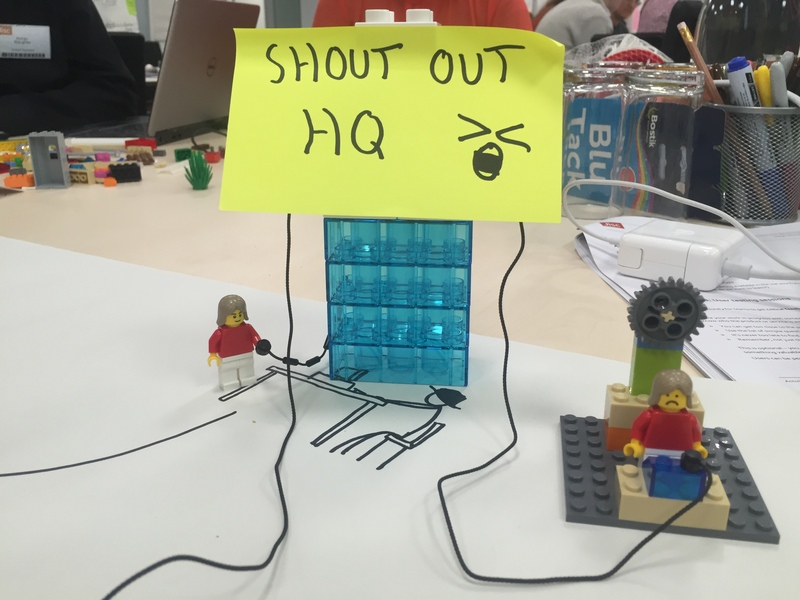 Teams produce a number of outputs as a part of the process which requires a large supply of paper, post-its, bluetack and marker pens. Before someone shouts “I thought this was about technology, why are you using paper” I will explain. The rationale behind the design sprint is to explore, build and test simple designs and prototypes. It saves time and money, imagine the waste involved in developing a product to find it is not what users want. Secondly for us the paper on days 1&2 can be visually displayed as seen here. Day 2: Decide and develop the idea. Focus is what becomes key on day 2, teams need to decide what is important to their product. They do this by exploring the user journeys to, through and from the product. Developing user stories to look at different types of people who make want to use the products. Finally, user testing, teams will test out their solutions and products with other participants, mentors and experts to get feedback. We use a speed dating approach so teams can get a range of answers to the same questions. Day 3: Prototype and test. Teams will now start to build some wire frame design of the products. These can be paper or screen based prototypes of the product they are developing. User testing continues and teams. This year we introduced a new activity using Lego “Serious learning”. The session was first thing on day 3 and I feel the timing was perfect, it helped the teams step back from their idea and look at it from a different perspective. It is all the process as much as the product but here are some of the outputs. I should also add the mentors participated and seemed to get significant benefits from this activity. Day 4: Test and practice pitch. Each team prepares a pitch for the last day. They are told to state the problem, share the solution and say what the benefits are for identified users. Teams will also have to pitch at the end of August which is when Jisc decides which ideas it will look to develop or support in 2016-17. After four years of student innovation competitions we can definitely say it is a life changing experience for all the students who participate. We have even seen some successful products from previous winners and Jisc is currently working with Call for Participants, Unitu and Potential.ly used by 1000s of students and several institutions. We have also produced four apps from last year, the SALT- Student Academic Literacy Tool was launched in the Apple app store last week. The summer of student innovation changes every year and next year will be no exception. We are looking for a more sustainable and scalable model. To engage more with institutions as well as more students. Link up with more enterprise hubs following our successful collaboration with Emerge Education, EdTechFutures and The House London in this year’s start-up programme. So look out for this year’s winners, I will say more about the ones we decide to support further at the end of August. Posted by Paul Bailey on August 15, 2016 in Uncategorized. Student Academic Literacy Tool (SALT) is now available in the apple and google app stores, for ios and android. It’s mission – to help students to improve their standard of academic writing by providing a handy reference with checklists and charts to track progress. Just to remind you, the SALT project was started with the aim of developing a resource to improve student writing by working in partnership with students to produce a set of materials which would make the key features of a good academic writing style accessible and identifiable to students spanning a range of ages and abilities. 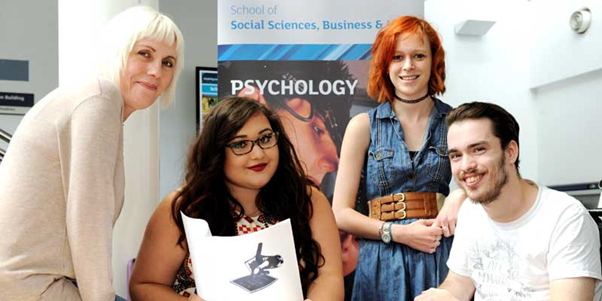 The partnership team was established in May 2014 and included Dr Sue Becker (Senior Lecturer in Psychology); Luke Kennedy (final year Psychology undergraduate); Holly Shahverdi (second year Psychology undergraduate) and Nadine Spence (First year Psychology undergraduate). The team were all based at University of Teesside. Following research, it became obvious that a mobile tool would be most effective so the team decided to enter the Summer of Student Innovation competition. They were successful and received our help in Digital Futures to turn their idea into reality. SALT is the first SOSI app to be launched, but it certainly won’t be the last! We made the app using Xamarin, a cross platform mobile app development tool that allows us to make native apps quickly. Follow some initial prototyping and feedback, we released a version of the tool for user testing, gathered feedback and fed that back into the development pipeline. We have a prioritised backlog of really nice features to add to later versions but we know this project needs to consider it’s sustainability so we’re helping the team explore that. In the meantime, we’ve got a modestly simple, yet incredibly useful little tool here and it’s time we shared it! Posted by Justin on August 10, 2016 in Uncategorized. The Software Development and Games Programming course at Shipley College is constantly being updated to keep it current. One aspect of this was the increased use of visual programming tools, such as Scratch, as used in Code.org’s Hour of Code activities and Blueprints, as used by Unreal Engine 4, a state of the art game engine. The students have all reacted very well to these new tools and this year we had eight students leave with D*D*D*, which is the highest grade possible. However, last year we had a new student who wanted to join the course who is visually impaired – he has no light perception whatsoever. This makes anything which uses drag and drop inaccessible, as his screen reader software, Jaws, can only work with text. do I say that he can’t join the course? do I change the course to suit his needs? do I somehow differentiate the material so he can access it? At Shipley College we strongly believe in inclusion and so the choice was a simple one to make, but very hard to execute. We tried different approaches to find out what worked best for Callum. Fortunately my wife has many years of experience working with assorted special needs students and gave me some great ideas on where to start. For the scratch projects, I used laminated prints of the scratch nodes, glued to foam board, with Braille added manually using craft supplies and QR codes added to the back of each node – the goal has always been to make the resources so that Callum can work independently. This worked really well, but it took a over a week to create the resources for an activity that took an hour. Obviously I had to find a method which I could automate. I knew I could create 3D models of the nodes using code and started to think that 3D printing would be a possible way to automate the whole process. To test this we got the cheapest 3D printer we could find on eBay – this cost around £160 and came with no instructions but it eventually printed a 3D model of a Scratch node. The challenge then was to add Braille to each node, along with text so that Callum’s LSA could also read what the node was to be used for. The solution for this was to print an inverted V, with text on one side and Braille on the other. To make sure they could be read the same way, the text was also inverted. This was then tested by Callum and another VI student, who both said they could read the text and the Hour of Code activity worked really well. The only issue now was the reliability of the 3D printer. We needed a professional 3D printer, but we did not have the budget for this. This is when we saw the Accessibly by Design competition on the JISC Elevator. We quickly made a video and entered the competition, the prize of £5000 would have made this project viable and was something we desperately needed. We were overjoyed when we found out that we had won funding. 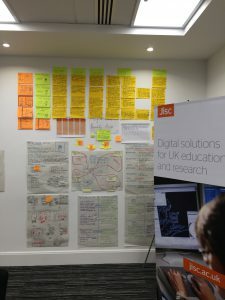 Besides the funds for the printer, JISC organised four development sprint days, hosted by each of the winners. These really helped focus the development of our ideas and helped get our students not only involved in the project, but to also have valuable experience, first hand, of real development meetings. The first thing the students did was vote on a name for the project and selected ‘Project ViP’, for project Visually Impaired Programming. We managed to get the projectvip.info domain for future use too! Working with JISC, students from Shipley College’s year two Software Development and Games Programming course worked on the design and development of the Python and OpenSCAD code to convert virtual items into physical ones. We created tools to enable not only Scratch nodes to be used, but also Unreal Engine 4’s Blueprints and Lucid Chart Flowchart symbols! We have gone through many iterations to try and reduce print time. We have tried everything from printing as one big block, using Lego connectors and even printing each piece of text separately and mounting it on a perspex block. The latter approach is the one we have settled on, due to the current limits with 3D printing. The students worked really hard on this project, with some of the year one Software Development and Games Programming students operating the new MakerBot Replicator. As part of the year two students project work, they each wrote a website showing other people how to use the tools they have developed. We took the best parts from each website and added this to the ProjectViP.info website – this should be the one stop place to get more information on how to create physical objects from virtual ones. This has been a great success, as Callum has finished the year with six distinctions and three merits! Well done to everyone involved, especially JISC for top rate support and helping us to approach the project in a structured way with clear objectives at each stage. Finally, we are also looking at a spin off from the main project. We are placing individual letters, with text and Braille, on top of a Lego 2 x 1 base. Lego showed some interest in this and we are now looking at how to get this to market. Posted by Paul Bailey on July 15, 2016 in Uncategorized. Taking part in the Jisc Accessible by Design competition has been one of the high points of my time at Jisc thus far. We have seen a number of highly innovative projects come to fruition as part of the project. 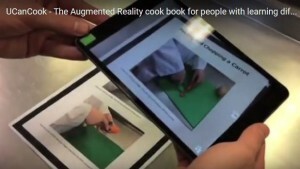 This has included the UCanCook augmented reality cookbook from Doncaster College, the visual programming for the visually impaired project from Shipley College and the Specific learning difficulties stories e-book (now video) project from Sheffield University. On the 12th of May it was the turn of the MAP project as developed by National Star College in Cheltenham to pitch the project to us. The Jisc team arrived at the fantastic National Star College campus in glorious sunshine which nicely matched the enthusiasm of the MAP team Simon Bartlett, Neil Beck and David Finch. National Star College is an Ofsted Outstanding College for young people with a range of learning difficulties and disabilities. The College and it’s students were featured in a series of programmes on the BBC called ‘The Unbreakables’ which you may have caught in 2015. We had a tour of the College starting with coffee in the Star Bistro, which is an award winning restaurant on the College campus that provides the Students with work experience opportunities and visiting Jisc staff with great coffee and tasty lunches. The site tour took in the sensory rooms, the Karten funded print shop StarPrint, a number of classrooms and dedicated spaces such as the adapted dance studio, performance spaces and hydrotherapy pool in the therapy centre. The MAP (My Access Passport) presentation from David, Neil and Simon showed off a functional prototype of the tool. Essentially MAP allows a Windows computer user to customise their desktop accessibility options and ‘save’ these settings to a flash drive or to a cloud based server. You can think of MAP as a ‘portable roaming profile’ in that the settings can be taken from a computer on one domain to a computer on another domain or indeed to any standalone computer. For a good description of roaming profiles see the AbilityNet factsheet. One of the reasons why this is powerful is that users can now have their profile configured with the support of an assistive technologist such as Neil, save these settings and then have the settings applied to any computer that they choose. However the profile is setup, this is going to save a lot of time and could be the difference between a user being able to use a computer and simply not being able to use it at all. The software is still in development and at this time the prototype can set a limited range of options, however the potential for this approach to make things much easier for the many people who can only use computers thanks to the built in Windows accessibility options is fantastic. I noted on the day that this is an idea ‘that really needs to exist’ having seen students frustrated with having to recreate their settings on personal computers at home, in a public library or on an employer’s computer when on work experience. With this project a profile that you configure at College can easily be transferred to home, work or any other context that will support it. The MAP project requires client software that is installed on the machine that you wish to use your profile on, this means that computer networks will have to become ‘MAP ready’ and Simon has already designed an icon to indicate that an organisation is using MAP. This icon is similar to that used to denote an induction loop is available for use. I was really impressed by the progress the MAP team have made since we last saw them in January. This project has the potential to make a real difference to a lot of people and is a great example of how the pioneering work of an Independent Specialist College such as National Star can have an impact at scale for many more people. For more information on Specialist Colleges, take a look at the Natspec (The Association of National Specialist Colleges) website. If you like the look of the My Access Passport project you can vote for it on the Elevator site. If the project gets at least 250 votes the team will be invited to an initial meeting where they will have the opportunity to convince a panel to help fund the project’s development. Voting closes on the 6th June 2016. Rohan Slaughter – Jisc Subject Specialist. Posted by rslaughter on May 23, 2016 in Update. Team SALT- Who are we? We are a team of four- three students and an academic. Nadine Spence, Luke Kennedy, Dr Sue Becker and I have been working as a student partnership for around a year and 6 months now to develop ‘The Student’s Academic Literacy Tool’ (SALT) for students in FE and HE institutions to improve their academic writing style. We are all from different years of study and the SALT project brought us together. From the minute we came together as a team we have got along really well and worked well together which has been great! The project began after Sue Becker had spent several years delivering a first-year core module during which students submitted their first piece of assessed writing at the University. She observed high levels of anxiety amongst successive cohorts as they had little knowledge of what was expected of them in their first piece of extended writing at university level. Students’ lack of preparation for the transition to university and unfamiliarity with academic writing style led to recognition that support for improving academic literacy needed to be embedded in disciplines as part of the first-year experience (Hathaway, 2015). As a way of supporting students to recognise and improve their writing styles, Sue had started to run a diagnostic academic writing test and provided targeted feedback to students as part of a formative assessment in their first term. Unfortunately, the highly-specialised nature of the test meant that both students and tutors on the module required extensive guidance and support to understand the technical aspects of academic writing identified in the diagnostic test. The Student‘s Academic Literacy Tool itself comprises two main elements, a checklist and a glossary. The key features of academic writing are divided into four sections: grammatical accuracy, correct use of language, structure/development of text and the use of relevant source material. Each section includes a set of criteria designed to enable students to identify key features of each element which they need to incorporate into their writing to enable users to assess how successfully they have met each of the criteria. 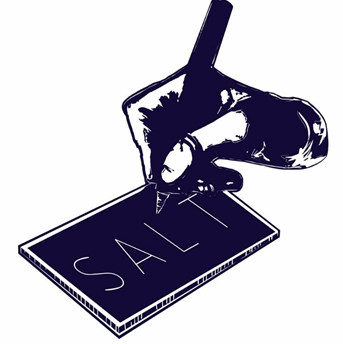 The second element of the SALT is a glossary, explaining each criterion in more detail and demonstrating, by means of short illustrative texts written by the student researchers, how these criteria appear in academic writing. Unlike the majority of teams, we already had our tool developed as a paper based tool and upon entering, we were already user testing the tool in FE and HE institutions in the North East of England. Our reason for entering SOSI mainly is because our feedback indicated a demand for an online-based version of the tool. So I guess our experience was pretty different to everyone else’s. I suppose in some ways, we had a head start. But the way the workshops are structured meant that in other ways this was also a setback, as once you have created one idea it can become difficult to change it. Attending the design sprints was a great experience for us in a number of ways. Firstly, it was a test of the strength of us as a team. To spend four, 8 hour days working solidly on unpacking your ideas and then reducing them down again wasn’t the easiest thing we have had to do in our time together on the project, and I personally feel that we were too quick to take prioritise everyone’s opinion but our own which really slowed us down at one point. 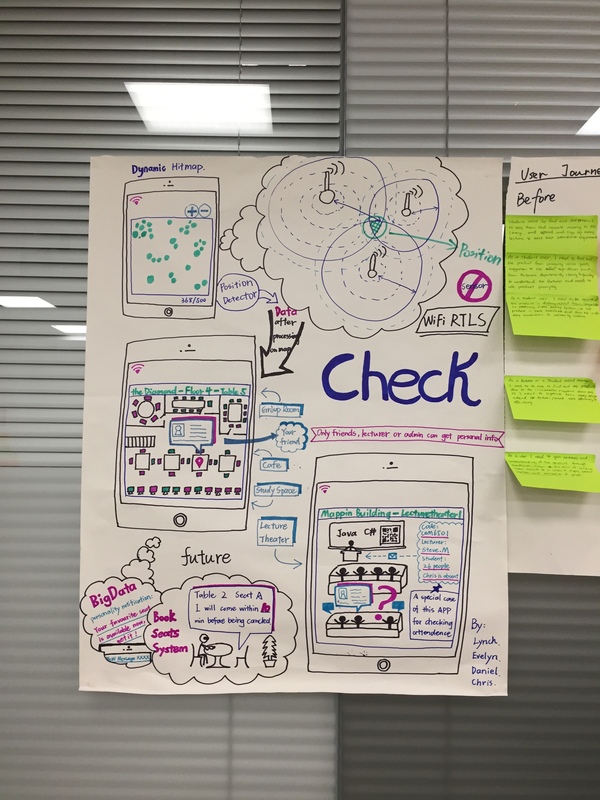 However, towards the end of the four days we really began to pull our ideas together for an app that would be most effective for students to use. I think the main thing that our team have taken from this experience is that one concise idea is much more useful than lots and lots of ‘oh that might be pretty good’ kind of ideas. The most effective components of our tool have been tried and tested over and over again before reaching a final version. You cannot always use your own judgement alone, but equally, you have to have a certain degree of belief in your idea otherwise no one else will. Basically, all I am saying is that if someone criticises your idea, it really is a good thing. It shows that they have taken the time and interest in your idea and want to help you make it more effective. Since its dissemination, interest in SALT has grown through publications, conference presentations and national media coverage following the Team’s success in winning the SOSI competition. This has led to the Student’s Academic Literacy Tool being used across a number of Science and Technology disciplines at Teesside University and in addition it is being used in a number of other Universities across the U.K. Since winning the SOSI competition, SALT has also been shortlisted for a Guardian University Award, and most importantly, the app will help a lot of students to attain a higher standard of academic writing and reduce their anxiety. I personally would encourage anyone who thinks they have a great idea to enter the SOSI competition. I would even go as far as to say it has been life changing where our project is concerned. Having the opportunity to network with professionals and gain support to develop your idea is such a great thing to be able to have access to. However, too many times have I seen people come up with an idea who haven’t done their background research, so my advice would be to choose something that brings something original and useful to the education sector. There is a lot of competition out there, so it is up to you to bring new ideas, and JISC will help you with the rest! Posted by Justin on May 9, 2016 in Uncategorized. If I had ever doubted the power of engaging learners in innovation projects, today certainly dispelled any doubts in my mind. In November we selected four teams from the Accessible by Design competition to work on ideas to address accessibility and inclusion in education. We have just concluded the design sprint with three of the teams who presented what they have achieved over the past three months. The eBooks for Specific Learning Difficulties Team now based at the University of Sheffield are producing a web site to support learners with Specific Learning Difficulties such as Dyslexia. The web site provides digital stories (see example) of how individuals have used technology to support their own learning needs. The power of these stories is that they are real solutions from real learners. 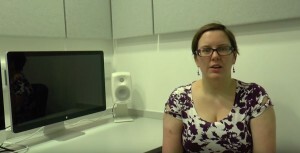 The videos are being produced by Gemma Holtram, now Assistive Technology Officer at the University. She has recruited four Assistive Technology Champions to create the videos. The site will be available from Sept 16 and other institutions will be able to access the site and also submit their own digital stories. 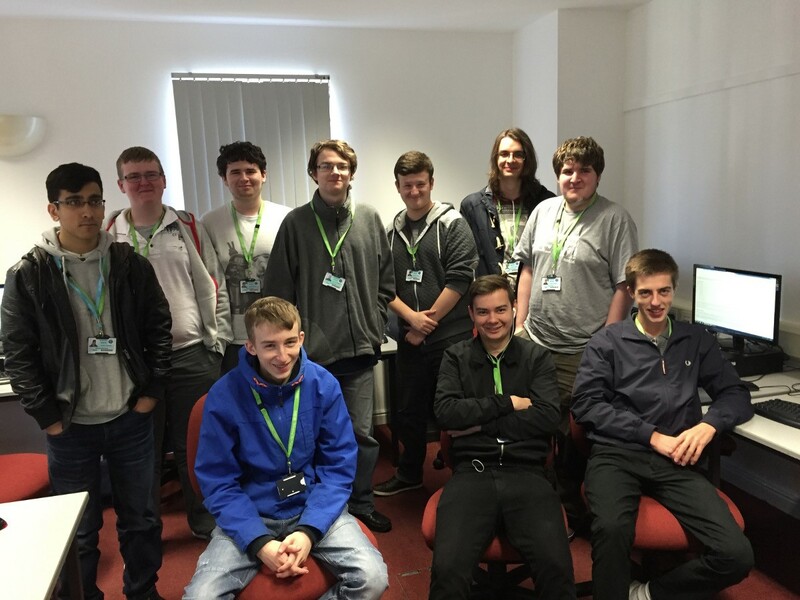 The team from Shipley College have used students on technology courses to produce 3D printed resources with braille to enable their colleague who is visually impaired to participate in the same visual programming activities. See this video for an oveview. These 3D resources have been designed and printed by the learners (with first class support of their lecturer Steve who justly deserves an outstanding accolade) as part of their programming and design courses at the college. I jokingly asked Steve if he had managed to involve every college course in the project, the reply was almost, they were just working on the music students. The team are now preparing a web resource to allow others to use the 3D resources and provide a forum for support. The site is expected to go live in May and we will promote it via this blog. The UCanCook team from Doncaster College have produced a set of recipe cards linked to augmented reality video instructions to be used by adults in supported living. The team of learners led by Chris Medwell gave an engaging presentation, the highlight being a video of Ben in action cooking Sausage Paste. The augmented reality is used to engage the user and provide instructions in a format that can be more easily followed than traditional recipes. The team have also engaged a Michelin Star Chef to help create the healthy recipe cards and piloted them with users locally receiving excellent feedback. There is growing interested in the recipe cards and potential opportunity to turn this into small enterprise that the student can continue to work on. What all three teams have clearly demonstrated is the need to engage the user in the process. In this case the users have been learners in the team or their peers in the university or college. It has also demonstrated the huge benefits of learners undertaking a real-world challenge as part of their course. It has not just been about the process. There are also potential products that can be developed from these projects that will be available in the next few months. Jisc will continue to work with the teams to provide some support to realise the full potential of their achievements. What is certain is that they will all continue to engage learners in the process and we look forward to seeing the next iteration. We are still to meet with the fourth project My Access Passport from National Star College and I will blog about them when we have so you can hear what they are doing. Posted by Paul Bailey on March 21, 2016 in Uncategorized. Our challenge: could your students make an impact? 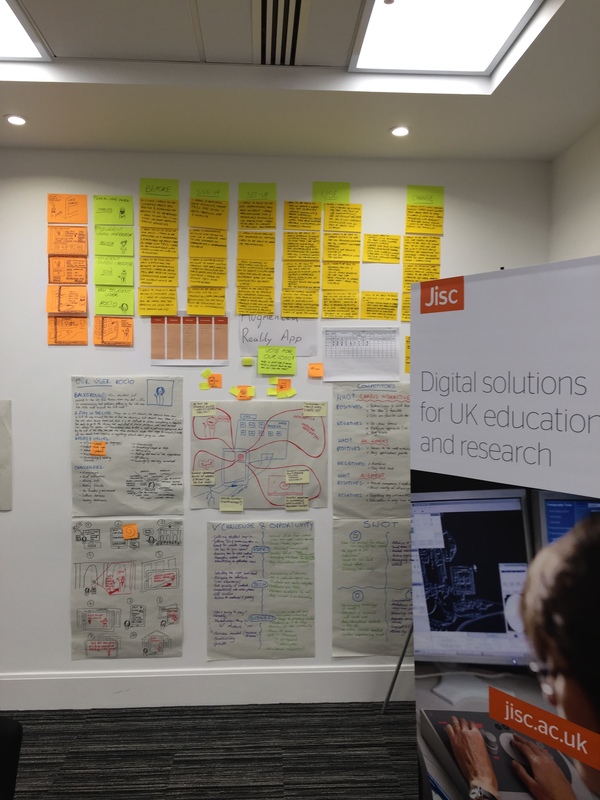 Jisc’s Summer of Student Innovation competitions are an opportunity for students to have an impact on life and study in work based learning providers, colleges and universities across the UK. Do your students have a bright idea that uses technology to improve study or student life? If so we’d like to hear it, and the best will be given funding, support and an invitation to a multi-day mentoring event to turn their concept into reality. Our goal is to unearth and develop the best ideas, creating apps and tools to be piloted in colleges and universities and harness the power of technology for better learning and teaching across the UK. What’s more, our competitions fit in with core curricula and encourage employability skills like team working, business planning and viability testing. Many colleges and universities now recognise students’ work towards our competitions as part of their coursework. Student Ideas Competition 2016 is open to all learners in universities, colleges or learning providers. We will select 15 successful teams who will receive £2000 per team to attend a four day design sprint on the 8-11 August. Each team will pitch to a panel on the 23 August and we will select five ideas to be developed into products who will receive a further £3000. Support Technology Start-ups 2016 is open to established teams with existing products seeking to further pilot their product within colleges, universities or skills providers. Up to five selected teams with receive £20,000 and participate in a six month pre-accelerator programme. The closing date for submissions is 23 May 2016. Posted by Justin on March 11, 2016 in Uncategorized. I’ve had the pleasure of connecting with the stage 2 SOSI winners from last year over the past couple of weeks and the first application has entered the development pipeline. We have chosen the Student Academic Literacy Tool (SALT) as our first development project. SALT aims to assist students to attain a high level of quality in their academic writing and does so with a simple checklist available on mobile devices in its first iteration. Students can use the checklist to identify ways in which to improve their writing standard, with each item expanding to a more detailed explanation. It services to motivate and raise awareness of the standard expected for academic writing and addresses the need for support in this area. Holly and the team SALT are working closely with us to steer development, with product sprint planning and review meetings every week and we aim to deliver value in the form of product features at the end of each sprint. We have discussed testing strategies and ways for users to feedback into the next development phase and we’re hoping to have MLP (minimum loveable product) ready for soft-launch BETA by the end of the month. I’m particularly interested to see how the idea will translate across disciplines and aimed at different levels of user groups. Posted by Justin on February 17, 2016 in Uncategorized.